The mission statement of The Newer Gods is simple. 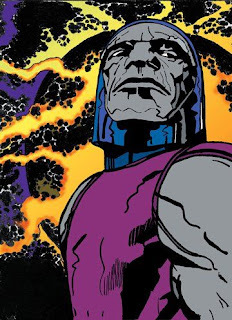 This blog will cover the wonderful and woolly world of Jack Kirby's Fourth World characters after the cancellation of his original runs of New Gods, Forever People and Mister Miracle. This will include every major, significant appearance by everyone from Lightray to Lashina, Metron to Mantis. It will also cover smaller or cameo appearances by these characters, although often in shorter mega-posts. Comments are always welcome and please let us know if we miss an appearance by anyone along the way! This blog is maintained by writer and would-be comic historian Nicholas Ahlhelm. His useless comic knowledge is as vast as Metron's wisdom and his nerdery is as powerful as Darkseid's Omega Beams. Outside writing about the New Gods, he also regularly writes his own super powered fiction. His novels include the Lightweight series, Epsilon, Quadrant and A Dangerous Place to Live. He is a member of the Pen and Cape Society, a group of writers of superhero fiction, and has contributed to three of their The Good Fight anthologies. Numerous short stories have appeared at a variety of publishers, including Flinch Books, Airship 27 and Pro Se Productions.